Get ready for the great escape! Summer is here and it is time to enjoy sunshine, beach life, hot sun and cool snacks! 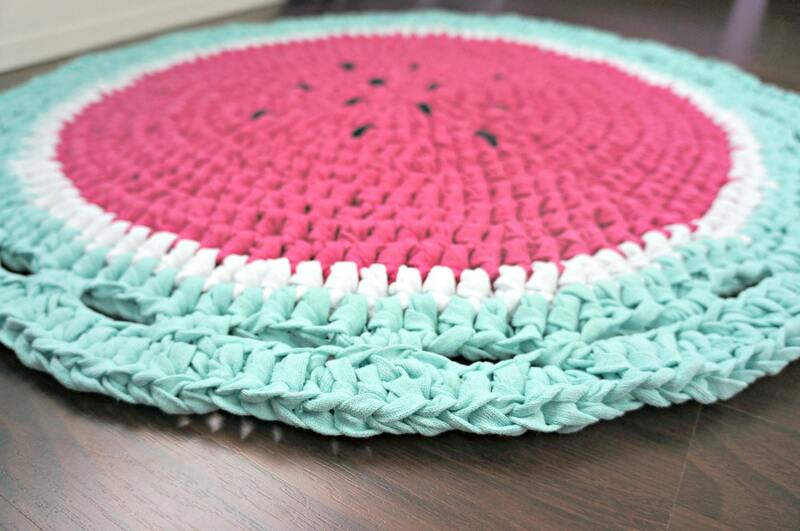 Set your kids room, terrace, patio or picnic summer ready with the playful watermelon nursery area rug and enjoy the hot days on this cool rug. 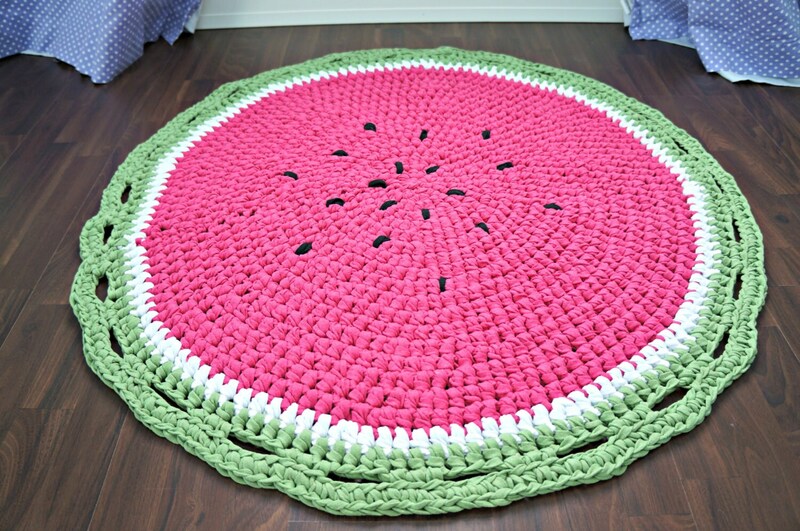 The Watermelon rug is carefully handmade for each receiver and sizes vary with your space. 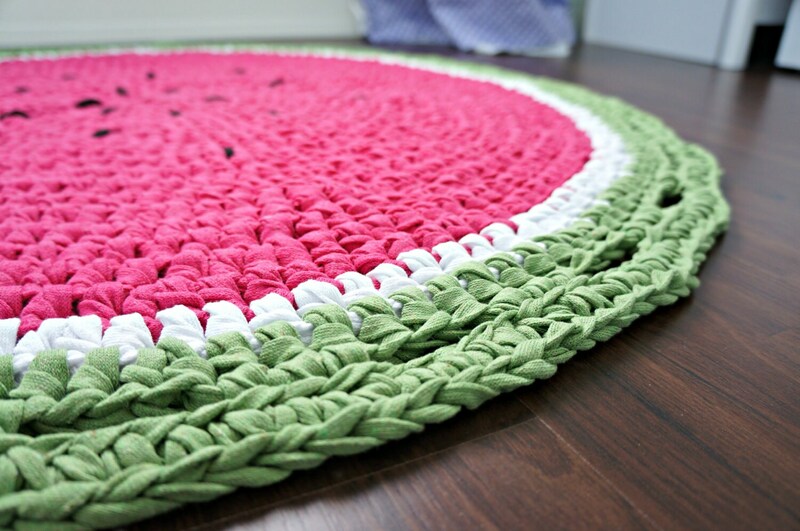 This rug is made of soft and chunky cotton yarn. If it gets dirty, just throw it into the washing machine and wash with warm water. Easy and durable for every day use, yet hand made and unique with a character. 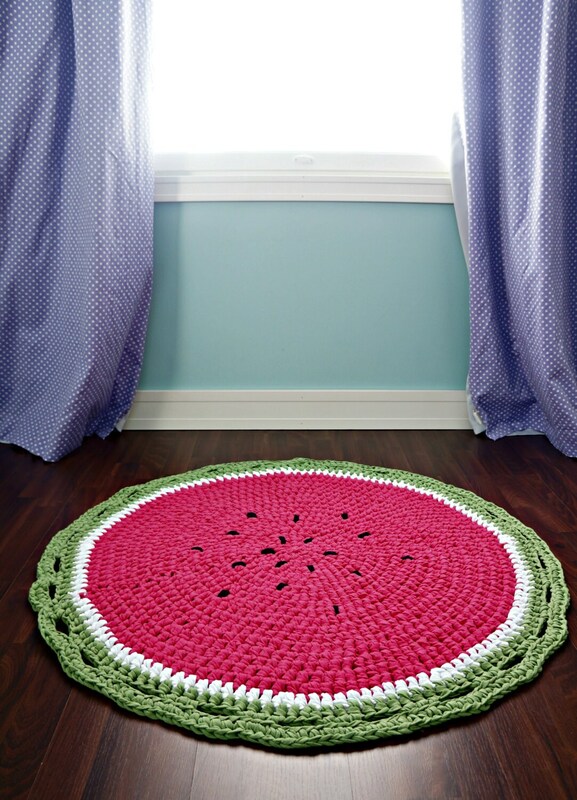 Choose the colour for the edge of the rug while ordering from the top down menu - either Spring Green or Mighty Mint! I accept Paypal, and direct checkout both accept Visa, Mastercard, American Express and Discover. Payment is due at the time of order. Thank you! 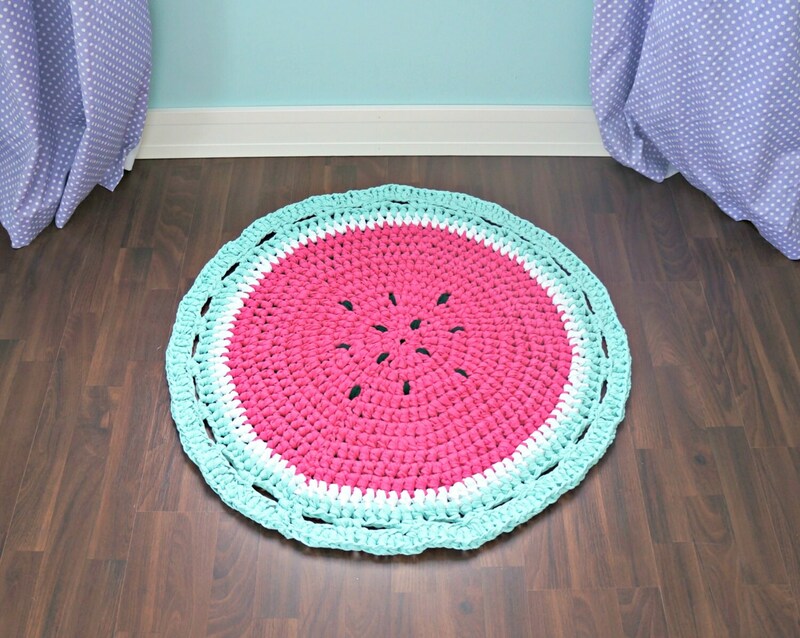 All patterns are shipped to the email on your Etsy account unless otherwise specified. I would be happy to ship to a different address if that is more convenient. Just send me a conversation with the alternative address. All patterns are emailed ANYWHERE and have no shipping charge for they are emailed out as a PDF file and will be sent out within 24 hours of payment. If you don't receive it within this time, please contact me. All packages are shipped via standard mail. Delivery times are Nordic countries 2-5 working days, other Europe 3-7 working days and rest of the world 6-14 working days. All international packages are NOT insured. If you would like to insure your package for an additional fee please let me know. Please be aware I do not pay any duties, customs fees, or any other associated fees. These fees are the responsibility of the customer. Please educate yourself on your counties customs information including any fees that may be incurred on your end before purchasing. This information can be found at your local post office or on the web. Every county varies. Thank you! Orders are shipping via Posti. If you would like to get SmartPosti package, package to your doorstep or home delivery, please let me know. All Finnish packages are NOT insured. If you would like to add insurance to your package for an additional fee please let me know. Sometimes the packages are shipped from the United States as the company resides in both countries. But this will be clearly stated before you buy your product and thus changes the shipping charges and times. My goal is to insure you have a good shopping experience and most of all I want you back. So, If for some reason you are not satisfied with your purchase, please contact me immediately, I am happy to work out an arrangement to your satisfaction. **CUSTOMIZED ORDERS ARE FINAL SALE. **PDF DESIGNS ARE FINAL SALE. If you have any questions relating to the products, patterns or custom orders, contact me vie email.